The Deities and the Devotees. 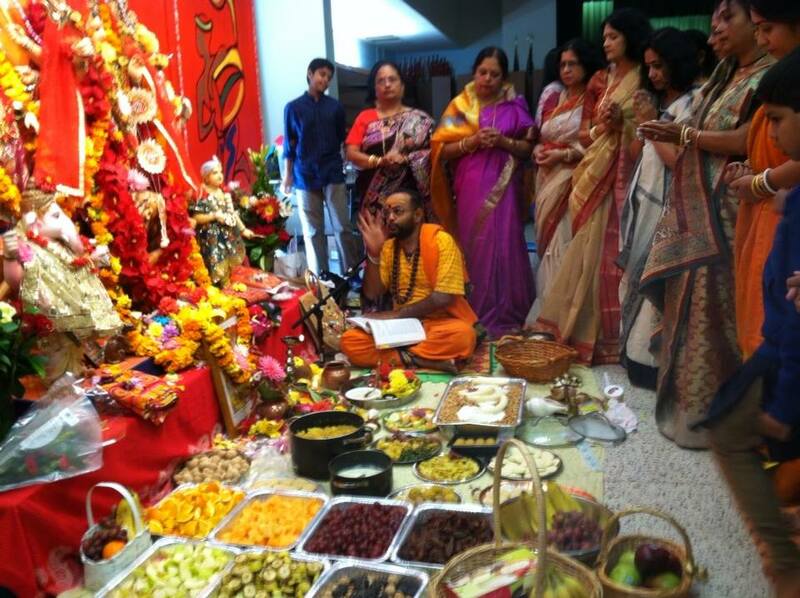 October is the season for our Hindu religious and social festivity. 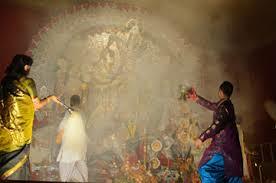 Durga Puja and Lakshmi Puja, followed by Diwali, Brother’s Day, and many more. Not too many people know here in America. But it is truly a fascinating, colorful time for us. 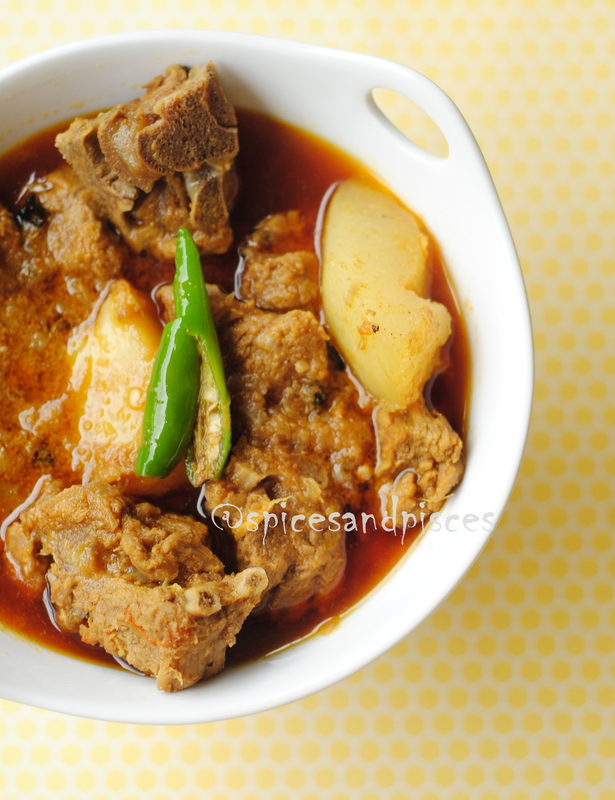 Because all of the religious celebrations and pujas are linked with food and fun. Food fun. And fun food. And to me, it’s more about food and fun than religion and rituals. Hindu religious festivals are absolutely, brightly colorful with mouth-watering food. And what’s more, because it’s directly linked with the sacred events, the food is actually even more healthy and pious than the often-extravagant and spicy Indian dishes. And you can’t complain about good, delicious Indian food with carefully preserved health qualities, can you? So, here’s some examples. 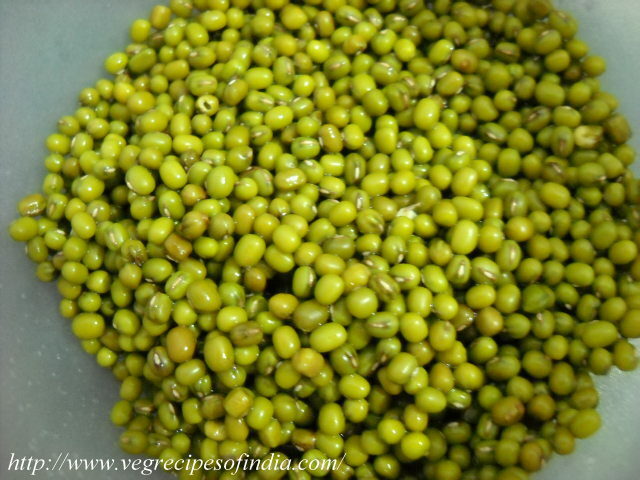 Early in the morning, before sunrise, priests often offer the deities (signifying special forces) with whole, un-sprouted Mung Dalbeans. With just a small dash of pure honey, or perhaps cane sugar. Bliss. Then comes the fruits. In this autumn season, when we begin to invoke Goddess Durga with ten arms and her four children — Ganesha, Kartikeya, Lakshmi and Saraswati — tropical fruits are plentiful. This is sort of the end of monsoon, but mangoes are still available. And mangoes from Bengal and India — you can’t beat that. They are heavenly. So, mangoes. And then, black berries, sugarcane (if you can find them at this time). Guava. Grape fruit. Lichi (perhaps too late for this summer). Papaya. Dates. Bananas (with seeds). Coconuts. And then vegetables. Eggplants. Plantains. Banana flowers. Inflorescence (bunch of banana flowers in that spindle-shaped thing, as they grow on the plant). All kinds of squashes, pumpkins and gourds. Known and unknown and less-known tropical, exotic vegetables. All natural fruits and vegetables only. No GMO fruits or artificially raised vegetables allowed in front of the deities. Priests would not accept them. Rice, lentils with coconut, a mixed-vegetable curry with NO onions or garlic offered to the deities first, and then as prasad(Sanskrit: prasadam) to the attending devotees. Perhaps, some chutney made out of Indian plum (in Bengal, we call itkool), tomatoes, or green papaya. Try it. I am salivating even thinking about it right now. Evening pujas (worship) begin with offering lots and lots of fresh flowers and garlands made out of the flowers. Marigold, lotus, lilies, jasmine, garden rose, rose, tube rose, you name it. 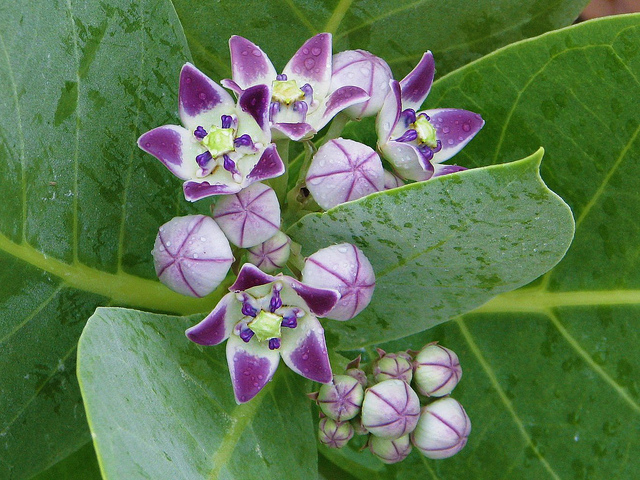 Even the wild Calotropis(Akanda) is used to offer prayers to Lord Shiva, husband of Goddess Durga. Shiva is the destroyer god, smokes opium out of a country clay pipe, lives in the Himalyays, and wears only a tiger-skin wear to cover the bottom. And he wears a garland of wild Akanda flowers. Not a very fashionable guy, really! And compared to his absolutely magnificent, gorgeous wife and four children, Lord Shiva is not the best dinner dance date. Well, except for the eldest son Ganesha who has the head of an elephant. Finally, the grand feast at midnight of Maha Navami (the great ninth day of the moon), the penultimate day of the four-day Durga Puja. 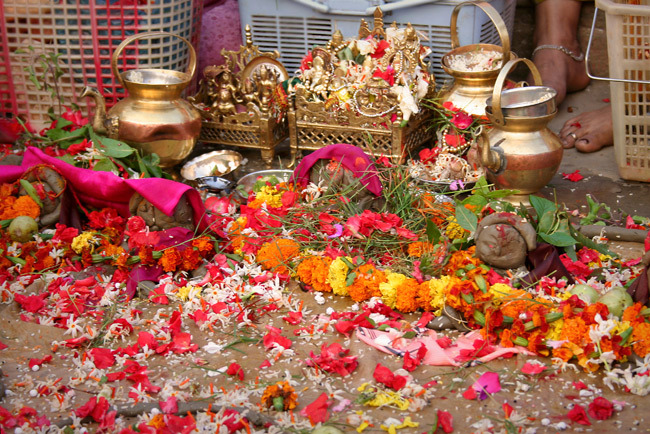 They celebrate it with loud country drums and gongs and bells, and they chant loud prayers, and priests and married women blow conch shells, and the puja place would be filled with smokes coming out of burning coconut shells thrown with generous amounts of resins and incense. And they would celebrate it with a sacrificed goat. Cooked with NO onions or garlic. Some people jokingly call it a “vegetarian meat” dish. Ha ha! Come to witness the wonderful Hindu celebration, where art and food and social traditions melt beautifully with religion. We’ll have Indian food together.